So many awards are presented for so many types of activities that the range of awards has expanded to suit the possibilities. 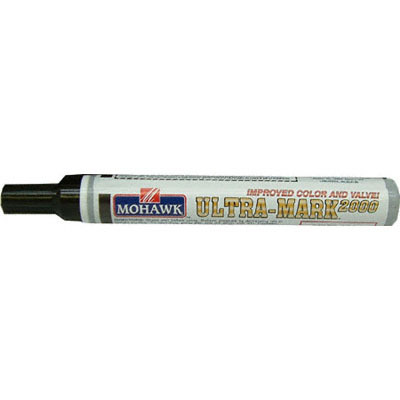 The arena of digitally imprinted plaques has many facets. Condé has found some great plaques for your business to offer to the outstanding performers in the community. Equally important are the photo plaques that bear witness to family occasions, weddings and reunions. These dual uses make plaques an integral part of a custom imprinting business, be sure to offer plaques of every size and material to appeal across a broad spectrum. 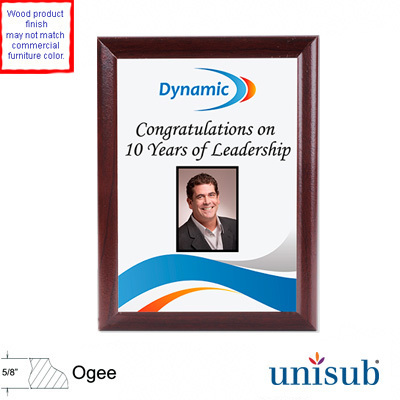 The Salesman of the Year will be impressed with a glass plaque imprinted with his photo and company logo. Likewise, the Most Valuable Player on the local football team will be thrilled to find himself presented with his photo and a team shot with their logo on a hinged two sided Chromaluxe™ piece. Both plaques serve well as awards or commemorations. Any of Condé's plaques can serve duty as an award or as a piece of art. Many artists are flocking to dye sublimation for the ability to present their creations in attractive manners that enhance color and definition in ways that could not be imagined in the past. All that remains is to choose the medium that best presents the artist's vision. 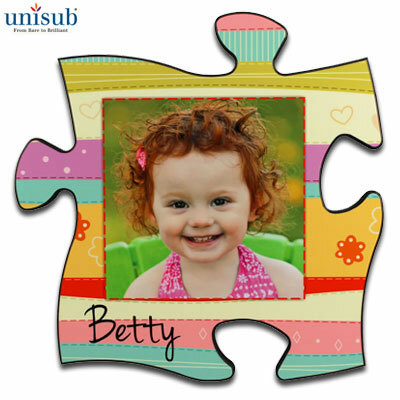 Dimensions: 12" x 12" .625"
Giant Puzzle Piece, Thick Unisub® MDF Plaque, 12" x 12" x .625", Raw Back with key hole. These unique wood plaques make excellent wall art, are used for schools, fit together into murals, etc. Great for Autism logo related signage. Dimensions: 8" x 10" x .030"
Dimensions: 8.125" diameter x .625"
Unisub™ Round Shaped Sublimation Plaque, 8.125" diameter x .625" with Black Beveled Edges, 5/8" MDF, White Gloss. Imaging Area: 7.625" dia. - 52 sq in. With keyhole for easy wall mounting. This plaque is made to imprint a ball graphic, but what else would work? 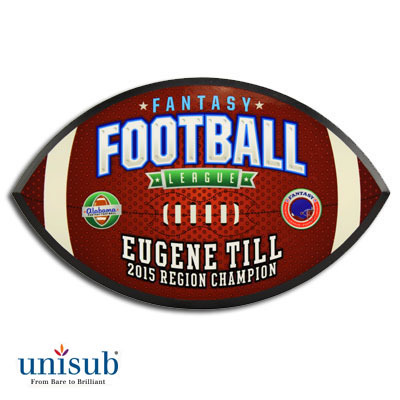 Dimensions: 10.5" x 6.25" x .625"
Unisub™ Football Shaped Plaque, 10.5" x 6.25" x .625" with Black Beveled Edges, 5/8" MDF, Imaging Area: 10" x 5.875" (47 sq in). With one keyhole for easy wall mounting. 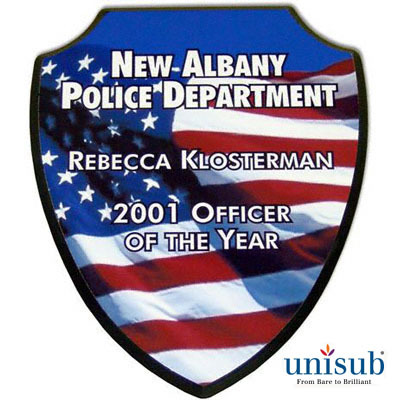 Dimensions: 5" x 6" x .625"
Unisub™ Shield Shaped Sublimation Plaque, Small, 5"x 6" x .625" with Black Beveled Edges, 5/8" MDF, Imaging Area: 4.625" x 5.625". With two keyholes for easy wall mounting. A great plaque for law enforcement activities. Dimensions: 10" x 10" x .625"
Unisub™ MDF HomePlate Shaped Plaque, White Gloss, Large, 10" x 10" x .625" with Black Beveled Edges, Imprinting area: 9.75" x 9.75" (69 sq in) 5/8" Sublimation MDF. With keyhole for easy wall mounting. MVP award? Great presentation plaque. 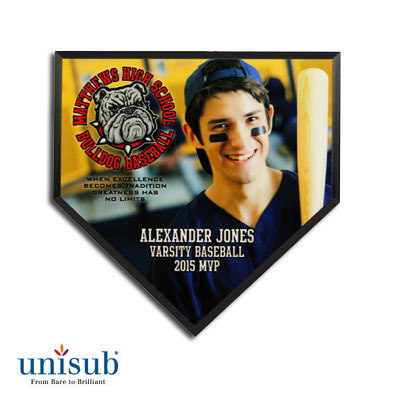 Dimensions: 6" x 6" x .625"
Unisub™ HomePlate Shaped Plaque, Sublimation MDF, White Gloss, Small, 6" x 6" x .625" with Black Beveled Edges. Imprinting area: 5.75" x 5.625". With keyhole for easy wall mounting. Perfect for baseball winners. 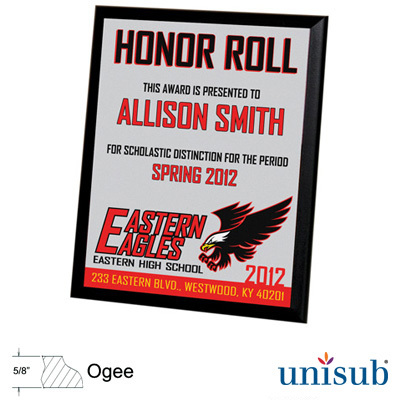 Dimensions: 5" x 7" x .625"
Unisub™ Plaque, 5" x 7" with Cherry Ogee Edge, Sublimation MDF White Gloss. Imprinting area: 3.875" x 5.875", 5/8" MDF. 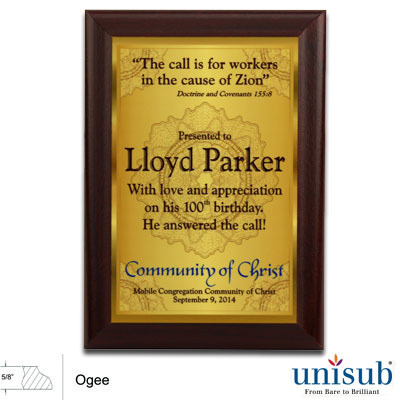 These plaques feature an ogee edge and two keyholes for easy wall mounting. Medium Density Fiberboard. 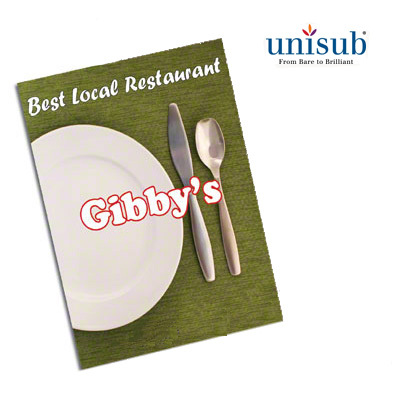 Unisub™ Plaque, 5" x 7" with Black Edges, 5/8" Sublimation MDF, White Gloss, Imaging area: 3.875" x 5.875". Ogee Edge and two keyholes for easy wall mounting. Medium Density Fiberboard. Dimensions: 8" x 10" x .625"
Unisub™ Perpetual Plaque, Black Flat Edge, 8" x 10" x 5/8" Sublimation MDF, full coverage, white gloss, imaging area: 7.875" x 9.875", with a flat edge for a larger imprint area and two keyholes for easy wall mounting. 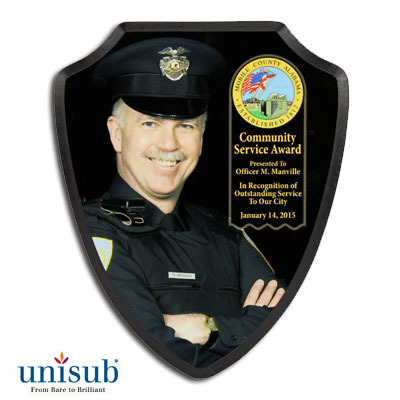 Unisub™ Large Shield Shaped Perpetual Plaque, White Gloss Sublimation Coated, Black Beveled Edges, Oversize, 7.5" x 9.125" x 5/8" MDF, Imaging Area: 7.125" x 8.875". Law enforcement loves these plaques for Officer awards. 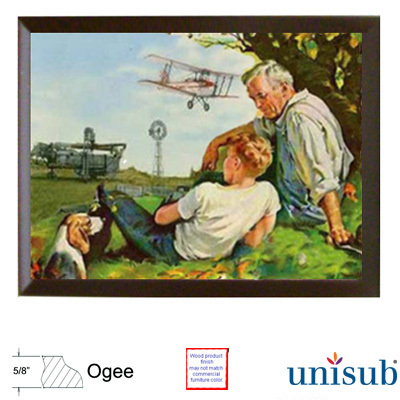 Dimensions: 12" x 16" x .625"
Unisub® Perpetual Plaque, Black Ogee Edges, White Gloss, Oversize, 11.625" x 16" x 5/8" Sublimation MDF, Imaging Area: 10.5" x 14.875". 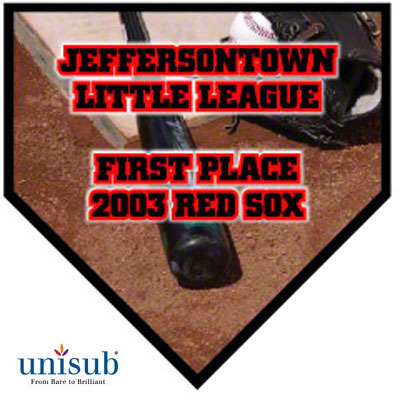 Excellent large plaque for class or team photo. 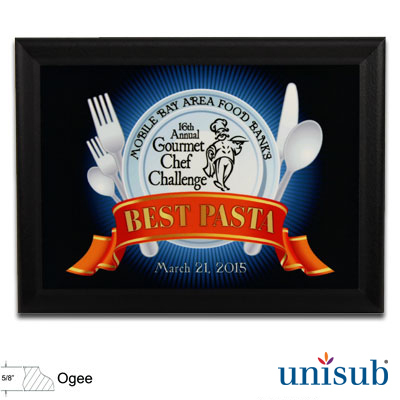 9" x 12", 1/2" Gloss White Sublimation MDF Plaque by Unisub®, with Straight Sided Black Chamfer Edge. Keyholed for landscape or portrait orientation. 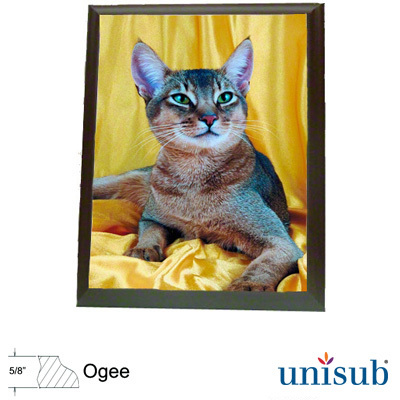 Expect vibrant images, scratch, abrasion and fade resistance, with a glossy coating. An economical plaque suitable for awards. Dimensions: 8" x 10" x .5"
8" x 10", 1/2" Gloss White Sublimation MDF Plaque by Unisub®, with Straight Sided Black Chamfer Edge. Keyholed for landscape or portrait orientation. Expect vibrant images, scratch, abrasion and fade resistance, with a glossy coating. An economical plaque suitable for awards. 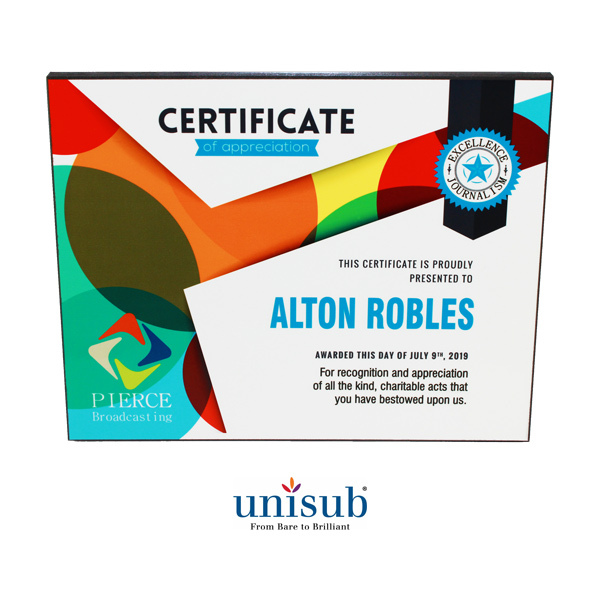 Dimensions: 7" x 9" x .5"
7" x 9", 1/2" Gloss White Sublimation MDF Plaque by Unisub®, with Straight Sided Black Chamfer Edge. Keyholed for landscape or portrait orientation. 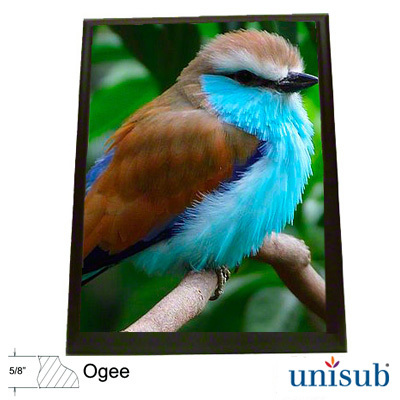 Expect vibrant images, scratch, abrasion and fade resistance, with a glossy coating. An economical plaque suitable for awards. 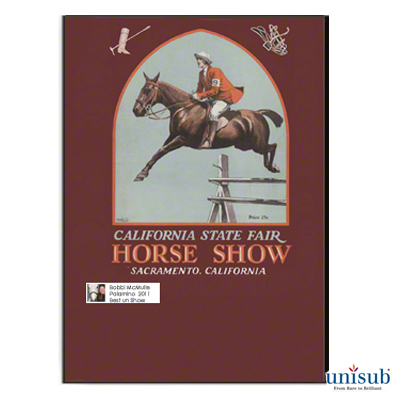 Dimensions: 9" x 12" x .625"
9" x 12", 5/8" MDF, Unisub™ Plaque, with Cherry Ogee Edge, Imaging Area: 7.875" x 10.875". Keyholed for landscape or portrait orientation. Any artwork will look fantastic when imprinted on this plaque. 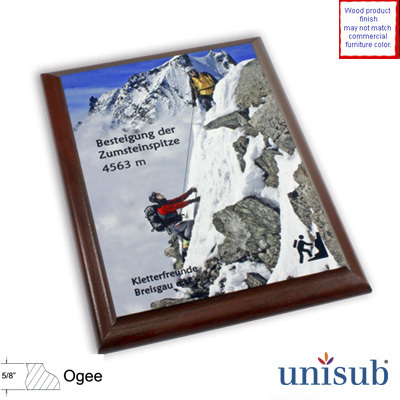 Unisub™, Plaque, 8" x 10" x .625", 5/8" MDF, with Cherry Ogee Edge, Imaging Area: 6.875" x 8.875". Keyholed for landscape or portrait orientation. Market these plaques for wedding and anniversary photos, too. 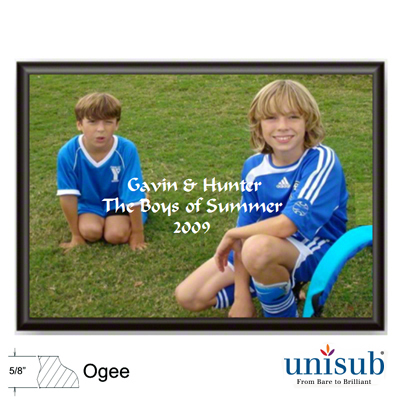 Dimensions: 7" x 9" x .625"
7" x 9", 5/8" MDF, Unisub® Plaque, with Cherry Ogee Edge, Imaging Area: 5.875" X 7.875". Keyholed for landscape or portrait orientation. Photo Realistic imprinting lends many ideas for smart and modern awards. 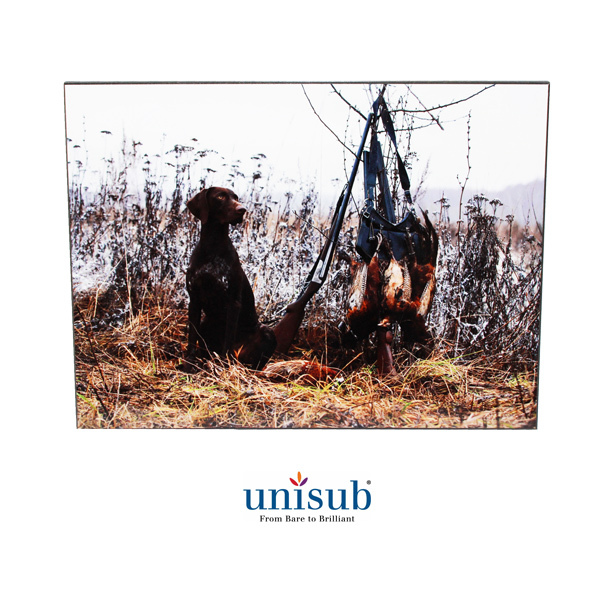 Dimensions: 6" x 8" x .625"
6" x 8" x .625", 5/8" MDF, Unisub® Sublimation Plaque, with Cherry Ogee Edge, Imaging Area: 4.875" x 6.875". Keyholed for landscape or portrait orientation. Pretty wood plaque looks great when imprinted with winning info. 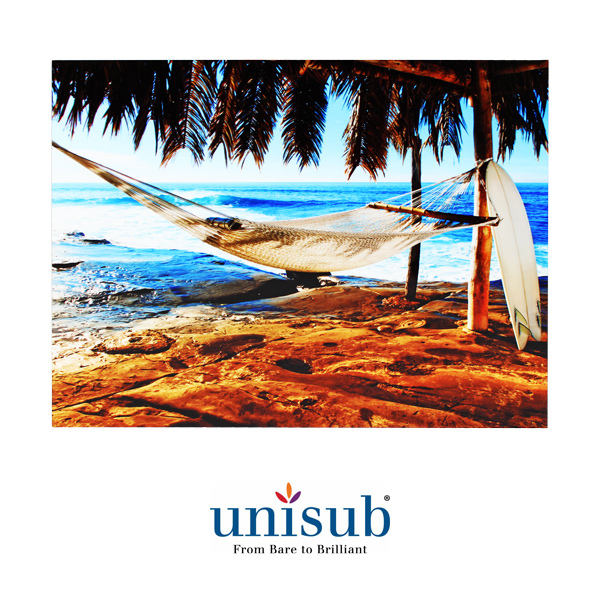 9" x 12", 5/8" MDF , Unisub® Plaque, with Black Ogee Edge, Imaging Area: 7.875" x 10.875". Keyholed for landscape or portrait orientation. Idea: Have winners supply you with several pictures, then create a collage on the plaque. 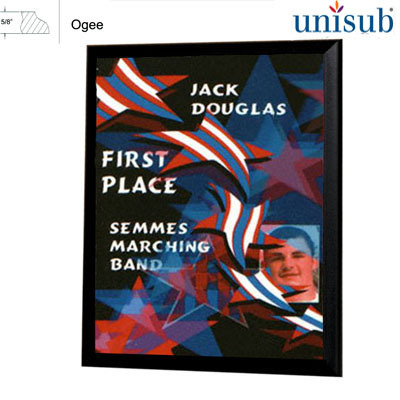 Unisub®, Plaque, 8" x 10", 5/8" MDF, with Black Ogee Edge, Imaging Area: 6.875" x 8.875". Keyholed for landscape or portrait orientation. Awards can be completely serious or totally fun. Imprint with action photos! MDF is medium density fiberboard. 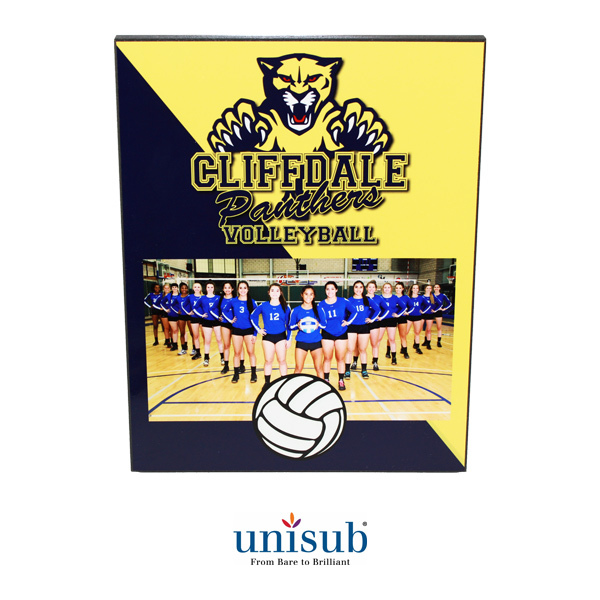 7" x 9" 5/8" MDF, Unisub®, Plaque, with Black Ogee Edge, Imaging Area: 5.875" x 7.875". MDF is Medium Density Fiberboard. Keyholed for landscape or portrait orientation. 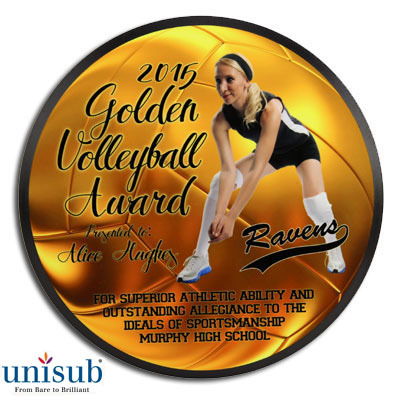 Gone are the days of boring two-color plaques... customize your plaque with photo-realistic images and text! 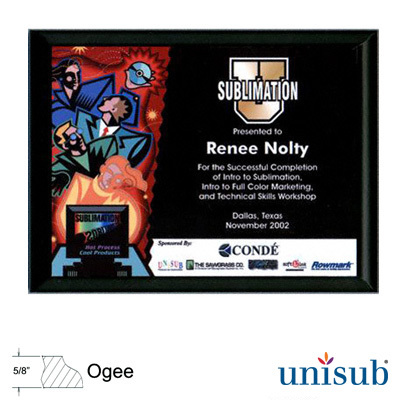 6" x 8", 5/8" MDF Unisub®, Plaque, with Black Ogee Edge, Imaging Area: 4.875" x 6.875". Keyholed for landscape or portrait orientation. Black edges really set off photos and artwork for awards.